Quinta Magnolia is an idyllic, peaceful paradise offering very high standard accommodation together with an excellent restaurant. 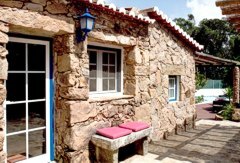 The property is spread over three historic, typical Portuguese buildings and is situated in a sun flooded natural mediterranean garden with local cork trees and many fruit trees. There is also a large pool area. From its elevated position the Quinta overlooks the picturesque village of Malveira da Serra and the towns of Cascais and Estoril. In the distance there are stunning views of the ocean. 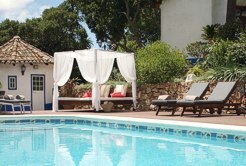 Quinta Magnolia is located in the Sintra Natural Park. The famous surfing beach Praia do Guincho and many other beaches are only a 10 minute drive by car, as are Estoril and Sintra. Sintra, one of the most beautiful towns in Portugal, has been classified as a World Heritage Site by UNESCO. It is a place of great beauty and interest, with plenty of palaces, historic monuments and wonderful gardens. The accommodation comprises 1 suite, 1 deluxe room, 2 standard rooms and 2 bungalows. All the rooms feature double beds except for the deluxe room which has adjoined twin beds. Each bedroom is furnished and decorated to very a high standard and great attention has been paid to comfort and detail. The furniture is mostly handmade and all linen is made of natural materials. All bedrooms have a private shower room with underfloor heating. 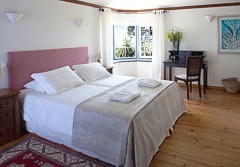 The bedrooms are air-conditioned and have Cable TV, telephone, internet, minibar and hairdryer. The suite also has a lounge. One of the standard rooms has an interconnecting door to the deluxe room. 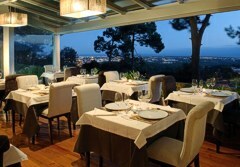 The Fins Club Restaurant at the Quinta specializes in the best local seafood combining it with organic vegetables and herbs grown in the Quinta's garden. The highly successful Fins Club concept has been created by Steven Snow, Australia’s most renowned seafood chef and Quinta Magnolia have brought the FINS concept to Portugal. The cuisine is enhanced by a great selection of the best Portuguese wines. The large swimming pool is surrounded by terraces and ponds and a beautiful garden with many colourful flowers and plants. A wide variety of treatments can be provided by professionals at the Quinta including body therapy, full body massage, pilates, facial treatments, Yoga and Chi Gong. Lisbon airport is approximately 25 kilometres away.